ADA compliance thoughts hurting my head. We're staying at a Marriott property and they have a shuttle van that will take you anywhere within 5 miles, but you need to give the desk 2 hours notice. I thought this was odd and asked. I was told the shuttle van was not ADA compliant and someone complained because able bodied guests could leave anytime without notice. Guests in wheelchairs would have to wait two hours for an accessible van to arrive. Since it wasn't fair to make some guests wait 2 hours, they are now making everyone wait two hours. Not surprisingly, most guests are not happy having to wait two hours and Marriott is getting a lot of complaints. 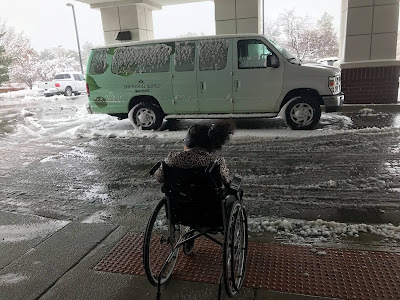 They are now planning on buying an ADA shuttle van. So they wouldn't do it because it was the law and the right thing to do, but are doing it to keep business travelers happy.